Getting back into my training program and also wanting to not eat meat poultry or fish everyday, I thought I'd make a vegetarian dinner yesterday. I didn't have time to go to the grocery store so I'd wondered what I could make with things I already had in my fridge and freezer. My husband wanted broiled Tilapia, so I made something I thought he could have as a side dish and I could have it as my main meal. 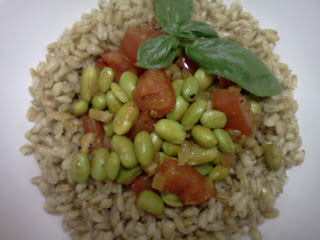 I found some fresh tomatoes, frozen shelled edamame and uncooked barley, and obviously there is lots of garlic and also onion. Start out with chopping your onions and your garlic and set aside, then cut you tomatoes into small cubes. You can take out the seeds if you like, but I didn't do that, as the Roma tomatoes I used didn't have a lot of seeds. Once you are done with all the prep work, heat a tablespoon of vegetable oil in a large pan or a wok, sautee the onions and the garlic until the onion becomes translucent. Add the edamame and the sesame oil and let sautee for about 5 minutes, add the tomatoes and cook a bit longer until they are soft but not mushy, season with salt, pepper and a splash of soysauce. Serve on a bed of cooked barley, brown or white rice, or even over pasta if you like!